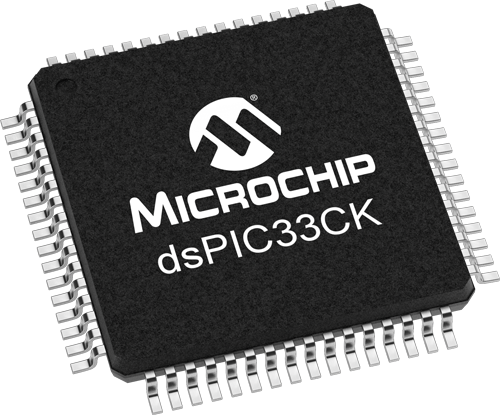 The dsPIC33CK family by Microchip features single-core digital signal processors (DSP). It is specially designed for functional-safe motion control applications. The dsPIC33CK digital signal controller (DSC) family provides CAN FD connectivity. It comes with A/D converters (3,5 million samples per second), analog comparators with D/A converters, and operational amplifiers. This enables motor control applications without external circuitry leading to smaller footprints. The DSCs include a 250-ps resolution PWM (pule-width modulation), which is suitable for advanced digital power topologies. Live update of firmware (with up to 2 x 128 KiB blocks) is also offered to support high-availability systems, especially important for digital power supplies. System designers looking for DSP power with the design simplicity of a micro-controller (MCU) can now utilize the launched 16-bit controller from Microchip. Designed to deliver faster deterministic performance in time-critical control applications, the dsPIC33CK family has expanded context selected registers to reduce interrupt latency and faster instruction execution to accelerate DSP routines. 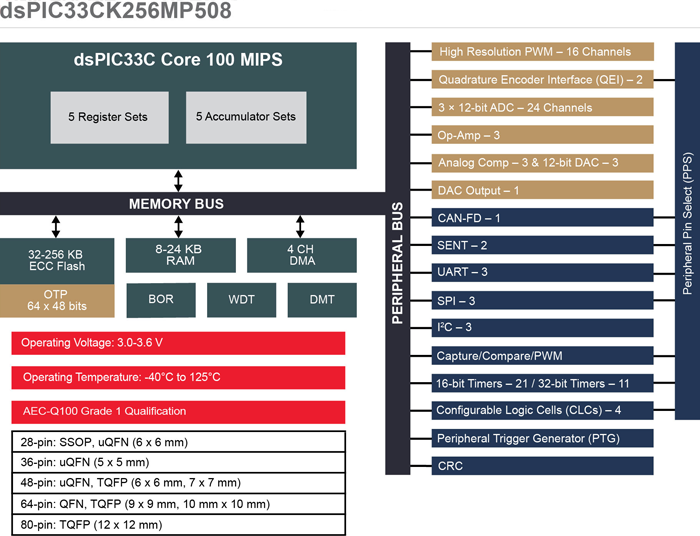 The dsPIC33CK single-core family complements the recently announced dsPIC33CH dual-core family based on the same core. With 100-MIPS (million instructions per second) performance, the core delivers almost double the performance of previous single-core DSCs from Microchip. This makes them suitable for motor control, digital power, and other applications requiring sophisticated algorithms such as automotive sensors and industrial automation. It has been designed specifically for controlling multiple sensorless, brushless motors running field-oriented control algorithms and power factor correction. The DSCs are also designed for functional safety applications, in which safe operation and shutdown in failure situations are required. The components include integrated functional safety features such as: RAM built-in self-test (BIST) for checking RAM health and functionality; deadman timer for monitoring the health of application software through periodic timer interrupts within a specified timing window; dual-watchdog timers (WDT); flash error correction code (ECC); brown-out reset (BOR); power-on reset (POR); and fail-safe clock monitor (FSCM). “Microchip’s 16-bit DSCs are highly efficient with minimal delay or latency into the system, and this new core is our best yet,” said Joe Thomsen from Microchip. “The feature set and performance make the dsPIC33CK family ideal for time-critical functions such as controlling the precise speed or rotation of a motor, as well as safety-critical functions to ease functional safety certification and ensure dependable operation.” The flash memory sizes range from 32 KiB to 256 KiB. The DSCs are supported by Microchip’s MPLAB development ecosystem. The Curiosity Development Board will be available in November.